• Are willing to take risks with their philanthropy. 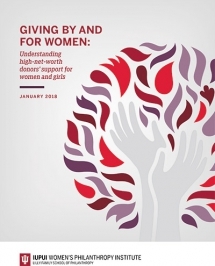 The report, Giving By and For Women: Understanding High-Net-Worth Donors’ Support for Women and Girls, is the second in a series of studies that explore how and why individuals support women’s and girls’ causes. The series is funded by a grant from the Bill & Melinda Gates Foundation. The study involved interviews with 23 high-net-worth women, all but one of whom was a current member of Women Moving Millions, an international philanthropic network of high-net-worth women established in 2007. Each of the participants in the qualitative study had given or pledged at least $1 million to causes for women and girls. Pseudonyms of the interviewees appear in the report to ensure open and candid responses to questions and to protect respondents’ privacy. Researchers grouped the responses into broad themes including the donors’ path to large-scale philanthropy; motivations for funding causes that benefit women and girls; their strategic approach to their giving; and their perceptions of their roles as leaders in philanthropy. The research builds on a prior Women’s Philanthropy Institute study, which was the first-ever empirical study of individual giving to women’s and girls’ causes. As more women accumulate wealth, they are twice as likely as men to leverage their wealth for philanthropy, according to a 2013 U.S. Trust study of high-net-worth women. Research has found that life experiences often guide women’s investment in causes for women and girls. By analyzing women’s motivations, values and experiences with large-scale giving, this study provides a roadmap for all donors to understand the connections between strategic, thoughtful and engaged philanthropy and making systemic change. The study also offers nonprofit practitioners a snapshot of donors with these interests and resources, to deepen awareness and understanding of how and why donors give.